Chávez responded defensively on Monday by calling Colombian President Uribe a “cowardly liar” and a “pawn to the United States,” while at the same time claiming that the American officials are speaking on Uribe’s behalf. He also announced that he would send Venezuela’s army to the 1,300-mile border the two countries share in order to stop the flow of contraband. But Chávez is not thinking of the flow of drugs from Colombia to Venezuela that concerns the U.S. Quite the opposite, his concern is the flow of highly subsidized products such as food and oil that are smuggled daily from Venezuela to Colombia. He is trying to discredit the U.S. officials by reversing public opinion and making Venezuela look like an innocent victim that needs to prevent Colombians from taking its food and gas. Admiral Mullen’s statement, though, is not simply a rhetorical attack on Chávez. Foreign Policy magazine reported in November that even though Venezuela’s military budget was thought to be around $1.67 billion in 2005, the country has spent over $4 billion between 2005 and 2007 on international arms purchases including 100,000 Kalashnikovs, 24 fighter jets, and 35 helicopters from Russia. Furthermore, according to the Miami Herald the only factory in Latin America that makes the 7.62×39 ammunition that the FARC needs for its AK-47 weapons is the Compañía Anónima Venezolana de Industrias Militares (CAVIM) which opened in 2005. On Monday, El Nuevo Heraldo reported that Colombian military intelligence officials told their reporters they have evidence that the FARC is using ammunition brought from Venezuela. 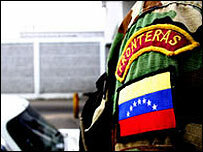 One of the officials said the evidence available did not indicate whether the ammunition reaching the rebels is “a consequence of the growing corruption that exists in the Venezuelan military and police forces, or the result of a policy by President Hugo Chávez.” Seeing that Venezuelan ammunition is making its way to the FARC, a greater Venezuelan military presence on the border may be interpreted as a significant threat to Colombia. John Walters’ complaint about Venezuela’s role in the drug trade is also not made out of thin air. U.S. officials now estimate that about a third of cocaine produced in Colombia, about 200 tons, now pass through Venezuela every year. According to the Washington Post, corruption among government forces on the border is so serious that a group of generals in the Venezuelan National Guard is believed to be running a virtual operation known as the Cartel of the Suns, a reference to the stars on their uniforms. Chávez’s argument that Colombians are consuming smuggled Venezuelan commodities is also true. Contraband gasoline was selling at about $1,500 Colombian pesos per gallon in border towns, while the same product in Colombia costs $5,000 Colombian pesos per gallon. Just hours after Chávez’s announcement, over 300 troops arrived at the border to check for contraband and Colombia’s news sources began to report supply issues in border towns. Some Colombians, especially those living on the border, are concerned about supplies, even though Minister of Agriculture Andrés Felipe Arias explained on Monday that Colombia’s production is large enough to ensure stable national prices and quality. Colombians living near the border with Venezuela will simply have to get used to paying the same amounts all other Colombians pay. He explained that Colombia exports more than a billion dollars of food to Venezuela. Meanwhile Senator Juan Carlos Vélez Uribe advocated for suspending food exports to Venezuela in response. Others are concerned with greater issues related to the arming of the border. Colombia’s major weekly magazine Semana interprets Chávez’s move as “showing its teeth to the United States and scaring Colombia” and asks why Colombia is not arming its own side of the border. Colombia Minister of the Interior and Justice, Carlos Holguín Sardi, who has taken over presidential duties while Uribe travels Europe, said that Venezuela’s decision is internal and sovereign and that the Colombian government does not see it as a threat. President Uribe seems to be tired of playing name-calling games with Chávez, and has not responded to his latest insulting statement. In the national media’s reports of the event, Colombia’s armed forces are compared with Venezuela’s and the possibility of some type of armed conflict is discussed. Even though the Colombian government is playing down Chávez’s politics, the negative relationship between the two countries may have real effects in 2008.